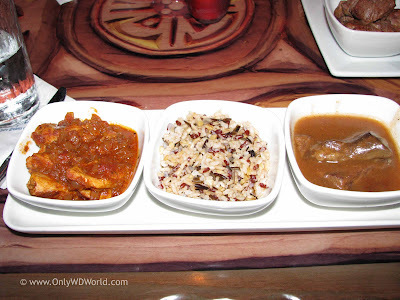 A Disney World Vacation is not complete without dining at one or more Disney World Restaurants. The restaurants at Disney's Animal Kingdom Lodge all provide a unique dining experience that is sure to be remembered. The newest Table Service Restaurant at Disney's Animal Kingdom Lodge is located in the new Kidani Village section of the resort. 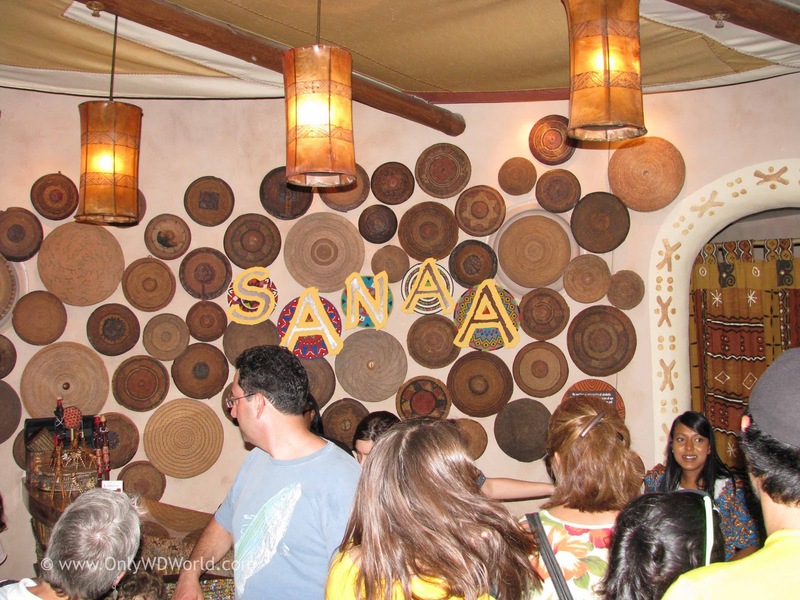 It is called Sanaa which means "work of art" in Swahili is just that. The restaurant is an amazing visual treat with an impressive collection of authentic works of African art. 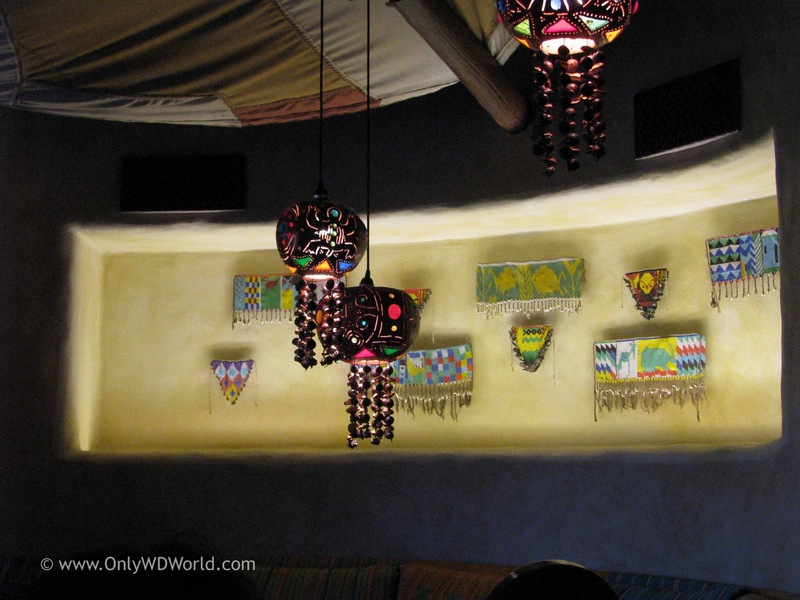 Previously Only WDWorld explored the artwork at Sanaa in an article called: "Touring Sanaa At Disney's Animal Kingdom." The food at Sanaa is a combination of African and Indian inspired cuisine. 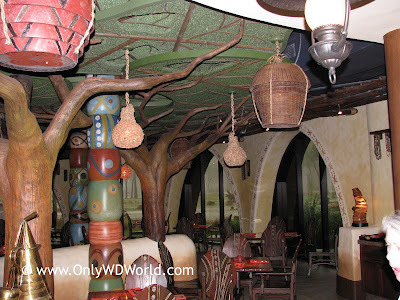 Like the other Animal Kingdom Lodge Restaurants, Sanaa is a dining experience that is not like your ordinary restaurant in your home town. This is certainly one of the benefits of the Disney Dining Experience. One of the most popular appetizers at Sanaa is the Indian Bread Service. You can choose three types of bread and three dipping sauces. My family's favorite bread is the Naan bread baked in the special ovens on-site, so we choose to get three portions of this bread and three widely different dipping sauces: Mango Chutney, Red Chile Sambal, & the Roasted Red Bell Pepper Hummus. This gave us a good variety of sweet and spicy and different textures. This was certainly enough for my family of 4 to share for $8.99. The dinner menu had entrees priced from $14.99 - $27.99. They accept Disney Dining Plan Table Service Credits and also accept the Tables Of Wonderland Discount. My wife and son chose the Slow-Cooked Combination meal where you choose 2 different meats and your choice of rice to accompany it. 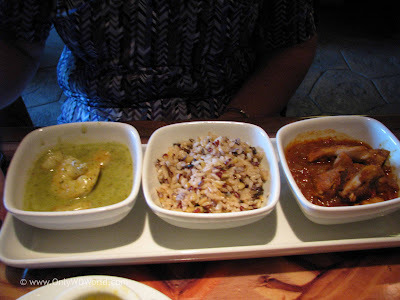 They both chose the Chicken with Red Curry Sauce and the Shrimp with Green Curry Sauce along with the Five-Grain Rice Pilaf. The meal was well presented and the sauces were very tasty. The level of spices enhanced the food, but did not overwhelm it. Throughout the restaurant you will find authentic African works of art. Each has a marvelous story behind it. There is a daily tour of the restaurant that allows you to learn more about the artwork and the design of the restaurant itself. 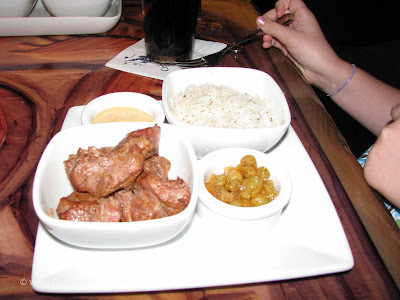 For my entree I opted for the slowed cooked Chicken with Red Curry Sauce and Beef Short Ribs (pictured above). The flavors were very good. The meal was different that what we would see at our normal restaurant stops and the flavors were wonderful. The meats were very tender from the slow cooking process. My daughter opted for the Tandoori Lamb (pictured above). This is lamb that is cooked in the specially designed Tandoor Ovens. She enjoyed the dinner, although the lamb was very chewy. The Dining Experience at Sanaa is top notch, although the prices are not. The entree prices are actually low enough that it is not a good value for use of a Disney Dining Plan Table Credit. You would be better off paying cash or using the Tables in Wonderland discount to dine here. The setting is amazing. Between the artwork, the design of the dining room and the view of the Kidani Village Savannah, this restaurant deserves to be on your list of ones to strongly consider. The meals had flavorful spices, but the were not considered strong. You can ask you server to have the chef increase or decrease the level of spices to your liking. In conclusion Sanaa gets high marks and is worth visiting during your next Disney World Vacation. 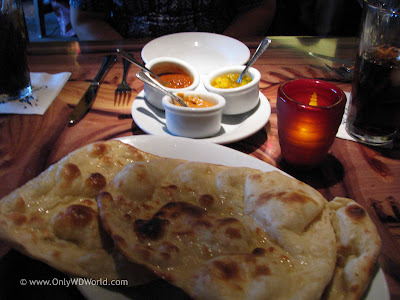 1 comments to "Disney World Dining: Sanaa"
I am really looking forward to my first visit here this month. The Animal Kingdom Lodge restaurants Boma and Jiko are already on my favorites list and I think I am going to really enjoy Sanaa.